Water, Glycerin, Zea Mays (Corn) Starch, Cetearyl Alcohol, Dihydroxyacetone, Mineral Oil, Petrolatum, Ceteareth 20, Ethylhexyl Isononanoate, Steareth 2, Dimethicone, Fragrance, Octyldodecyl Myristate, Stearic Acid, Hydroxyhexyl Acrylate/Sodium Acryloyldimethyl Taurate Copolymer, Isohexadecane, DMDM Hydantoin, Methylparaben, BHT, Ethylparaben, Propylparaben, Polysorbate 60, Citric Acid, Olea Europea (Olive) Fruit Oil, Avena Sativa (Oat) Kernel Extract, Tocopherol, Persea Gratissima (Avocado) Oil, Simmondsia Chinensis (Jojoba) Seed Oil, Calendula Officinalis Flower Extract, Caramel, Erythrulose. Makes my skin glow after using it! And it seems to help hydrate my skin, making it a more even complexion, and it helps make my rosy cheeks (I have rosacea) closer to my skin tone. Smells a little odd after a while... 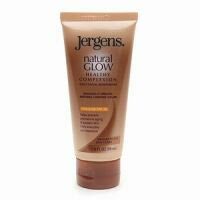 This stuff works pretty well, it doesn't make my skin very tan, it just helps even out my skin tone. Try it out :) Take note, it takes an application every day for a few days to show real results. non-comedogenic self tanner moisturizes cheap cheap :) chem sunscreen LOVE this stuff. I swear it helps my acne, whenever I use it I never break out. I used to think it just covered up and made my complexioin smoother, but I'm realizing I have no breakouts. which is crazy. anywho i use this stuff in the morning and love the non-comedogenic self tanner aspect!!!! !